On 22 October 2014 EUAM Chief of Operations Peter Appelby and Senior Ministry of Internal Afffairs (MoIA) Strategic Advisor Hanneke Brouwer were invited to comment on the MoIA strategy reform at the enlarged meeting of the Collegium of the Ministry. 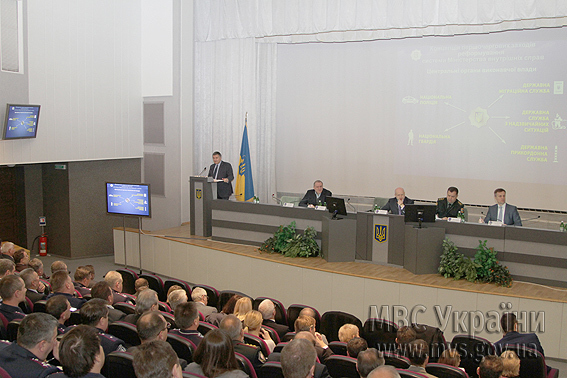 The concept of primary MoIA reform measures was officially introduced by the Speaker of the Verkhovna Rada of Ukraine Oleksandr Turchinov, Minister of Internal Affairs of Ukraine Arsen Avakov, Minister of Defense Stepan Poltorak, Head of the Security Service of Ukraine Valentyn Nalyvaichenko and the Head of Expert Council Evgen Zakharov. The wide selected audience of more than 100 people included high ranking senior Ukrainian officials and command staff, civil society, international representatives (EU, OSCE, NATO, UN etc…) and media. The main elements of the reform include depolitizisation, demilitarization and decentralization of the future independent civilian security bodies being the National Police, National Guard, national State Border Guards, State Emigration and State Emergency Services. Also, the Ministry of Interior will play a new role, in the sense that the government entity will be the coordination instance for all these newly independent bodies. Verkhovna Rada Speaker Oleksandr Turchinov spoke of a reform landmark. Minister of Internal Affairs Arsen Avakon finally invited the two EUAM representatives, to comment on the reform, as the mission will advise its implementation. Chief of Operations Peter Appleby welcomed the achieved progress and stressed the importance of coordination of efforts of all international parties that support the security sector reform in Ukraine, EUAM being at the center of this process. Hanneke Brouwer, Senior MoIA Strategic Adviser, mentioned the importance of further work and cooperation in the reform implementation process and acknowledged the mission’s full support towards it. The Cabinet of Ministers adopted the concept as of today. An action plan will follow within a month, before the reform will be submitted to the Rada for approval.